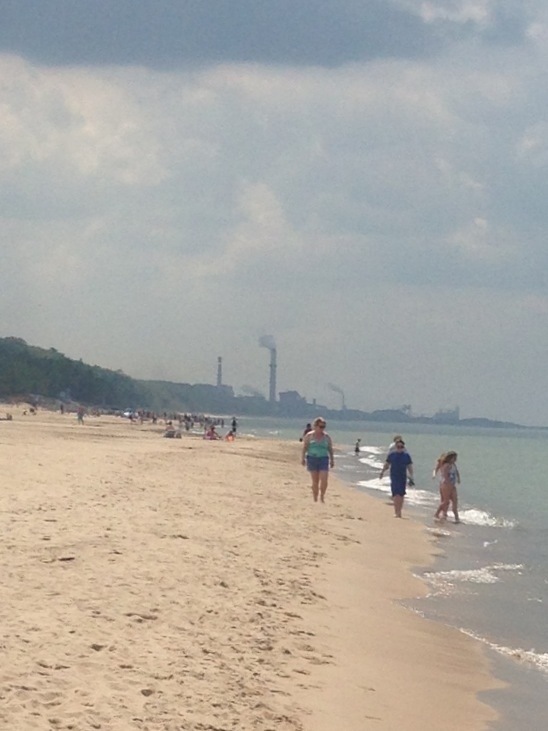 I grew up in Indiana sand dunes country, but had never been to the Indiana Dunes State Park as a kid or as an adult. It’s only a 40-minute drive from where I live now, but I learned two years ago that if you want to visit the state park any time between Memorial Day and Labor Day, you have to plan several months in advance. About two months ago, my cousin Lisa and I started talking about a late spring camping trip sometime in May. She and her husband, Tom, have a travel trailer, and Lisa’s brother, Dave, has a motorhome. We wanted to do a big cousin weekend camping trip at a central location to all of us. The date we looked at was the week before Memorial Day. I took a chance and looked at the Dunes and there were several sites still available. Score!! Those sites didn’t last long though. By the time the weekend rolled around they were booked solid. But we already had our sites, so the Lewis cousins (me, my brother Ron, Lisa and Dave and Lisa’s kids) took over a small section of the campground and all got to experience the park for the first time together. Once we got there and looked around a bit, we understood why the place books up. The sites were all good size and all paved. 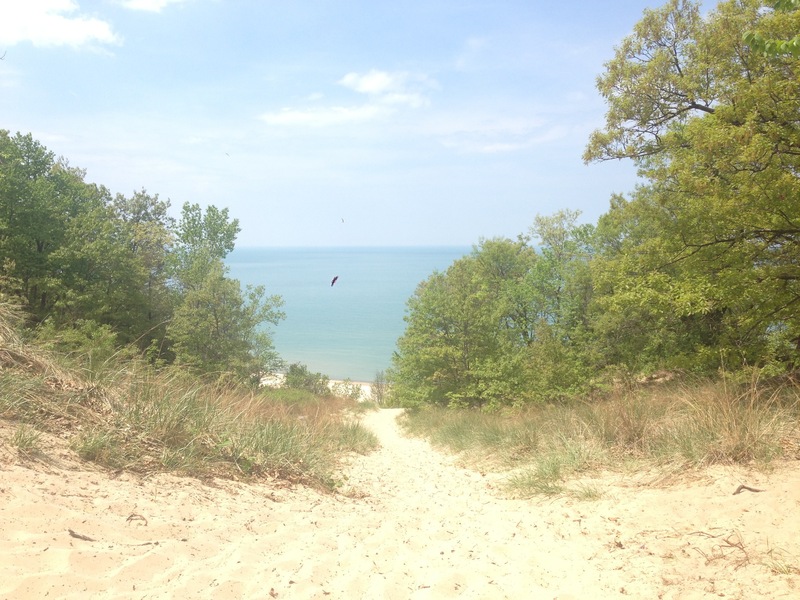 There are several miles of hiking trails in the park, including some that take you up and down Northwest Indiana’s famous sand dunes and the beaches are some of the nicest along Lake Michigan (minus views of the other thing Northwest Indiana is famous for — the steel mills). But it really is just a beautiful state park with a great campground attached to it. The other great thing about the park’s location is that it’s close to where my friends Tonya and Lisa live. So on our first night there, Tonya and Lisa and their significant others came out for dinner, a campfire and more laughs than I have had in a long time. 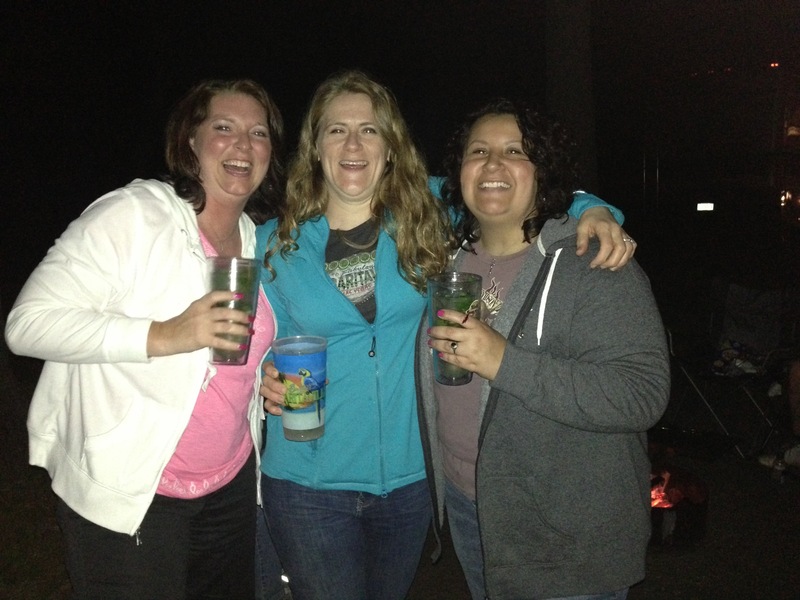 Lifelong friends: Tonya, Me and Lisa. The three of us have been friends for a very, very long time. Our whole lives, really. I feel so blessed to still have them in my life. We don’t get together as much as we would like, but when we do it’s so, so much fun. In addition to all of the fun we had just being together, laughing and hanging out, we also had a very active weekend. On Saturday morning Lisa, Tom and Dave had to leave for a bit so Brian and I went on a bike ride with Lisa’s kids. After that, Brian and I started out on a run and got less than a quarter-mile in when we passed Tom and Lisa who were just getting back. They wanted to come along for a run, too, so the four of us headed out. We went for a few miles, then came back for a bite to eat and to relax a bit before our next adventure. There are about seven different trails of varying length and difficulty in the park. We knew we wanted to do the longest one, which was 5.5 miles. Well, supposedly 5.5 miles. We found out later whomever tracked the mileage on that one had some faulty mileage-counting equipment. But more on that later. Brian wanted to do the long hike, but it turned out the Blackhawks playoff game we thought was that night was actually a day game, so Tom, Lisa and I decided to do the shortest hike (1.3 miles) while Brian watched the hockey game and save the long hike for when the game was over. The shortest trail was the only one of the seven that had a difficulty rating of “rugged” which was appropriate because that’s exactly how I felt when we were finished. 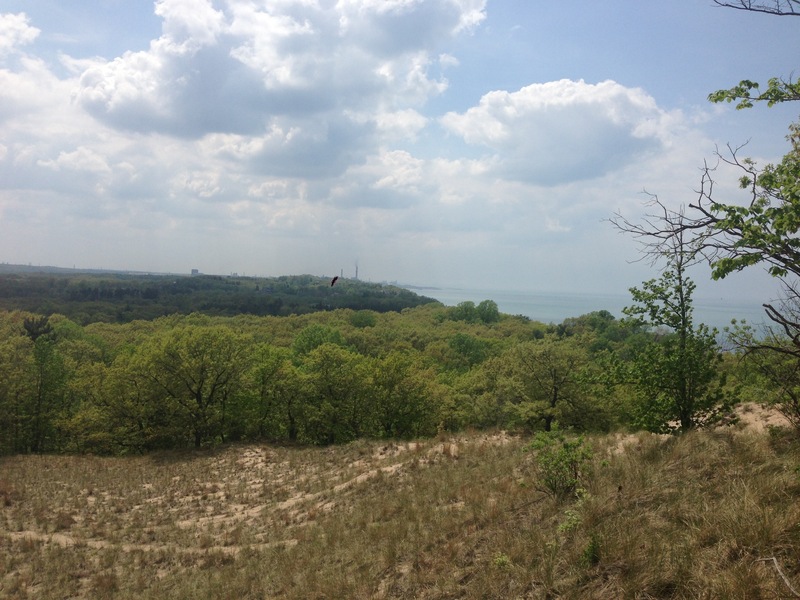 The trail took us over the three highest points in the dunes. The elevations don’t seem that impressive when you look solely at the numbers. 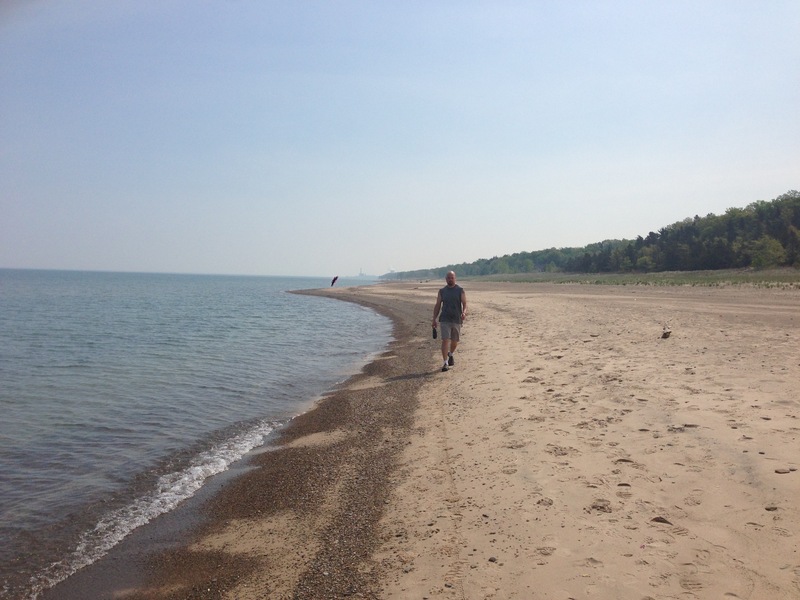 But have you ever gone running on a beach of soft sand? Remember how difficult it was? Now imagine that beach was all uphill. Holy Moly. Lisa trekking up the first of three steep dunes. To put it in perspective, I was wearing my DigiFit heart monitor for all the workouts I did that weekend and I burned almost as many calories on that 1.3-mile hike as I did a 7-mile hike the next day. But the views almost made it worth it. Almost. Once we returned, we felt we deserved some rest. And mojitos. After a few sips of those minty, refreshing treasures, we decided to put off the long hike until the next morning. We soon started dinner and our nightly campfire and spent another night laughing, reminiscing and having fun. And eating s’mores. There were lots of s’mores. But that’s kind of the point, right? You have one, and you want s’more. So, s’more we had, and we decided not taking that hike the next day would not be an option. We had to burn s’more calories. After breakfast the next morning, Tom, Lisa, Brian and I started out on what we thought was a 5.5-mile hike that would take about an hour and 15 minutes. It started out nice enough. We were in the middle of a forest so it was well-shaded and not too hot. Brian, wondering when the hike would come to an end. We were all using different apps to record our mileage, calories, ect., and they all came back at more than seven miles by the time we made it back. There was only one smallish hill, so it wasn’t a hard hike (it was no number 8), just a longer one than we planned on taking. It was a nice feeling to look at my workout history for the weekend on DigiFit to see all of the calories we burned while still enjoying the camping experience. Camping can, indeed, be a healthy experience. And you don’t even have to give up the s’mores! It’s also nice sharing a weekend with some of your favorite people in the world. 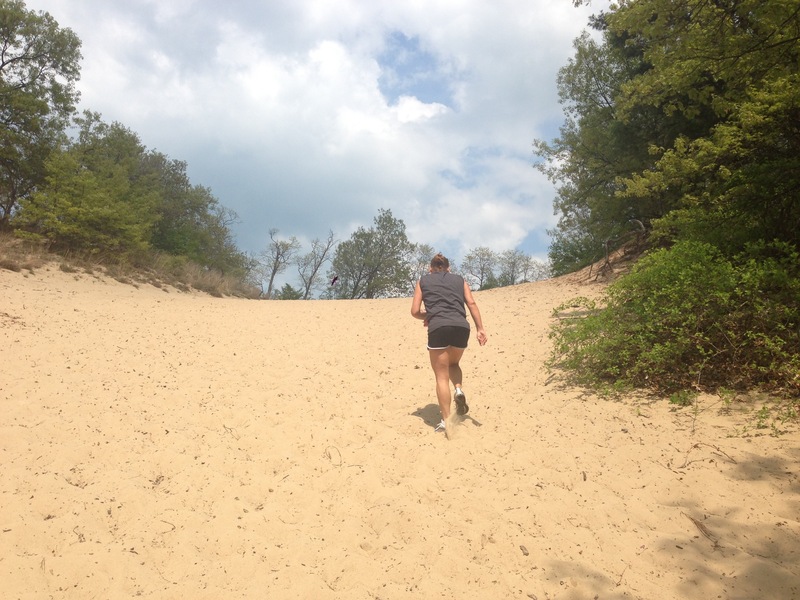 This entry was posted in Biking, Camping, exercise, Fitness, health, Running, Rving, traveling, Uncategorized, weekend getaway and tagged camping in Indiana, Hiking, hiking sand dunes, Indiana Dunes State Park. Bookmark the permalink. Our class trips were to Mount Baldy! Seems I have been everywhere else along that lakefront except the state park and national park (still haven’t been there).